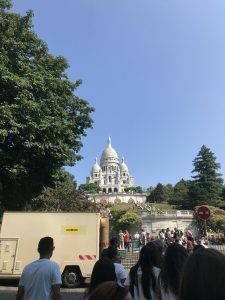 On Thursday, July 12th, we finished the last day of our journals by taking a trip to Montmartre and Le Sacré-Cœur, as well as taking a trip to the museam, Cité du Patrimoine et de L’Architecture. To start the day we met at ISA and took the train to Montmartre. Montmartre is an area that historically was not even considered to be a part of Paris. 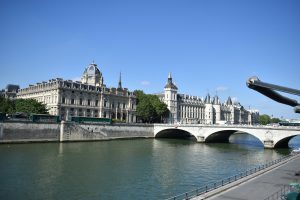 It was not until 1860 that the area actually became what is now the 18th arrondissement of Paris. 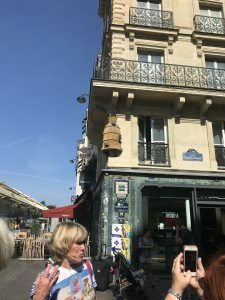 When we arrived at the metro stop, we talked about how Montmartre is typically less touristic, so what we should expect is to see more local Parisiens than we had seen at other places on our trip. 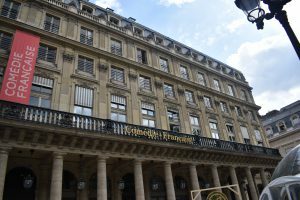 Additionally, we learned that the area is not as economically advantaged as other areas of the city, and that in the 1920s, many of the American writers from “The Lost Generation” actually moved to this area because it was much cheaper than other areas in Paris and because the First World War had made Paris cheaper in general. Le Sacré-Cœur is a huge church at the top of the hill of Montmartre that overlooks all of Paris, and to get up there it is a bit of a climb up, but nothing like I had experienced last weekend when I was in Lyon and walked up to Fourviere. 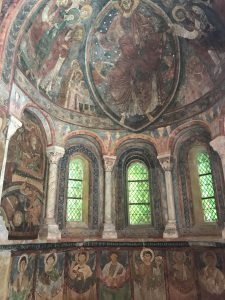 Before we got to Le Sacré-Cœur we visited a small church that had been there since the 12th century. 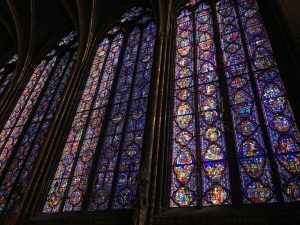 We talked about how a lot of the old churches had been destroyed by war, whether it was bombings from the Nazis, or rebellion in the streets of Paris, to have churches that go back as far as the 12th century is rare today. The church is called Saint-Pierre de Montmartre, and I thought it was really cool to be in a building that old. In the United States, the oldest buildings can date as far back as the early 17th century, but certainly, nothing that is as old as the 12th century! Regardless of religion, the churches are really cool to see and hold so much history to them, as well as architecture that it is really easy to appreciate them. After visiting Saint Pierre, we went to Le Sacré-Cœur and it was enormous on the inside, with a dome that was stunning to look at. 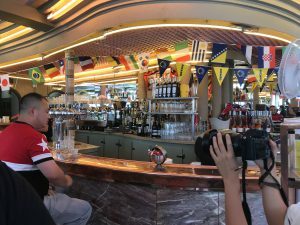 After Le Sacré-Cœur, we went to Cafe des Deux Moulins, that was featured in the movie, Amelie. I really enjoyed that movie that we watched for Professor Salmon’s French Cinema and Society class, so seeing the Cafe was a really cool experience. For lunch, I had a vegetable lasagna and it was delicious. The bar area was lit with neon lights, and it was just really cool to see something from the movie in person and eat there. After lunch, we headed off to the Trocadero, to see one of the city’s most famous views and to check out the architecture museum. Once we had arrived, we were disappointed because there was some sort of premiere for or the filming of the new Mission Impossible film. This meant we were not able to actually walk on to the Trocadero and we were unable to get the view from the platform itself. So instead of spending some time there we just headed into the museum to meet our tour guide. 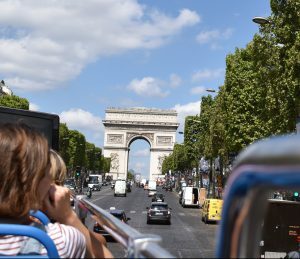 The tour took us through different eras of architecture in France and had pieces of some really cool historic architectural landmarks in the Paris and in other areas of France. 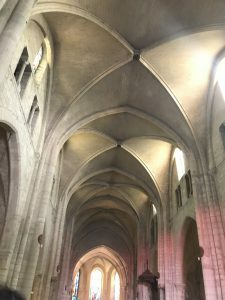 Some of the pieces of architecture that we saw included, a Romanesque style church facade, a gothic church facade, last judgment portals from multiple different churches, and a full 1950s style home that would be typical in a city in France like Marseille. 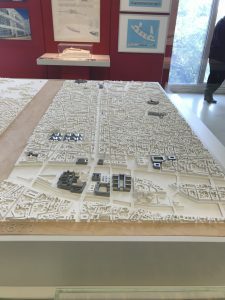 This museum was really interesting and did a great job of showing the transitions between periods of architecture, and how buildings and monuments have changed over time in Paris and other major cities in France. Today we started the day by traveling to the Pablo Picasso Museum. Before we even entered we were amazed by the building which had been used for the nobility at the time who wanted to move back into Paris because they were tired of certain rules and regulations they had to follow. These private hotels or small palaces typically had a large wall with big doors that would allow certain people to be brought in on carriages to the courtyard. We talked about how important light became and that is why they had so many windows. People started moving away from dark colors and dark paintings and started using more light colors especially with interiors of these palaces as we talked about later in the museum. Before entering we also learned that this museum was a gift from his family which donated many of his artworks and private collections to help start the museum. At the entrance, we were greeted with a copy of Picasso’s Guernica. 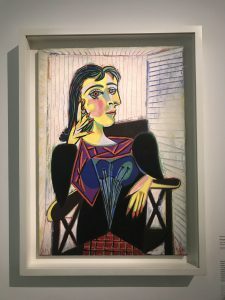 Picasso is one of the most well-known painters of the 20th century, and his works have gone on to inspire many other artists. The museum held a lot of early sketches of Guernica, detailing the artists, creative process. 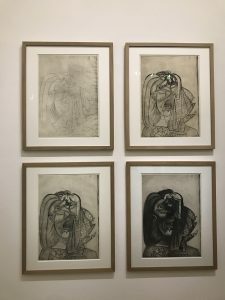 It was interesting to see Picasso’s work process, how he starts off his sketches and ideas and how they grew over time. 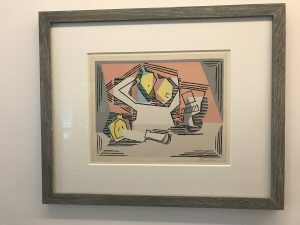 It was also interesting to see his progression from painting in more classical style, and having really defined subjects of his paintings, to complete abstraction. 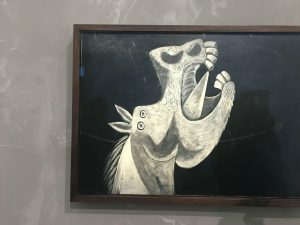 The museum also featured works of other artists who had been inspired by Picasso’s work and seeing other artists’ rendition and reimaginations of some of his most important pieces. 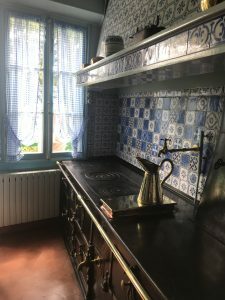 Also seeing where Picasso was from and understanding more about the political climate of Spain at the time, helped me to understand why he spent so much time in Paris and why going back to Spain was not an option for him. The museum also had an exhibit from Diego Giacometti, who was an expert of decorative ironwork. We talked about how sometimes, what some refer to as the “minor arts” do not get the same appreciation as paintings and sculptures, etc. Giacometti’s work was beautiful, and it was nice to see a museum where art like that could be given a major spotlight. After the museum, a small group of us found a restaurant called the Wild Moon and Bar where there were interesting drinks and foods to choose from. It was definitely a very “hipster” establishment, but the wait staff was very helpful and helped us to choose what we wanted to eat. 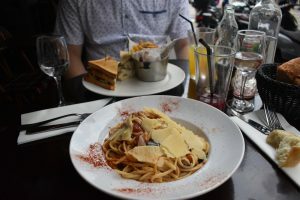 It was not the typical Parisian lunch, but it was something I had never experienced before so it was good nonetheless! Later that day, Aidan and I went to the bookstore and I got the book series, Caroline. Caroline is a very famous French children’s series. 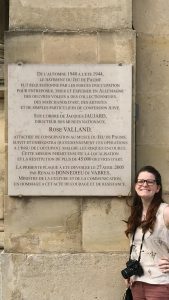 As a French major, I am really interested in all things that concern the French language, and children’s books are still a great way to introduce yourself to the language and start to understand a little bit more about the language. My mother really likes books in general, so I thought it would be nice to bring back a children’s book in French. After that, Aidan and I traveled the Jeu de Paume, where there a few different exhibits going on. I was really interested in this building because of the World War II, French Resistance heroine, Rose Valland. 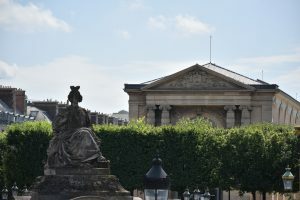 Rose Valland worked at the Jeu de Paume during the Second World War, and when the Nazis had taken control of Paris, they would sort all of the stolen art from all around Europe, and from the Louvre, through the Jeu de Paume. The Nazis did not know that Rose Valland could speak and understand German, so she secretly spied on them and would remember during her days working there where all the major art pieces were being shipped to. 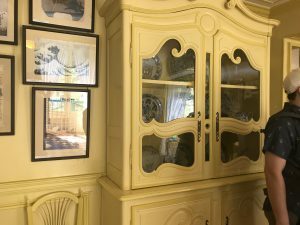 When she got home at night, she kept a journal, tracking every single painting that she had been aware of, and when the war was over, she revealed her notebook to the Allies, and much of the stolen art was recovered swiftly. If it were not for her, who knows how long it might have taken to successfully recover many of the lost pieces. I was disappointed that the museum itself did not have a statue or room dedicated to her, but they did have a plaque on the outside of the building to commemorate her heroics. While there, the only thing I could purchase for myself about her was another children’s book about her. 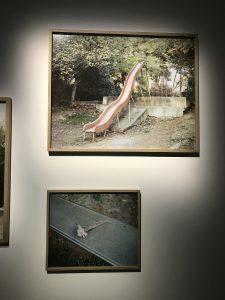 At the museum itself, there were a few different exhibitions, but one that I really enjoyed was of a photographer who explored the catacombs of Paris and the “restricted areas” underground to see what was still down there. 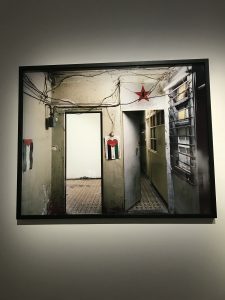 It was a cool exhibit, and I thought the Jeu de Paume was once again another great museum, and well worth it to visit. 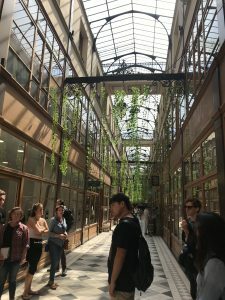 July 10th we had a guided walking tour of Les Halles. We first met at ISA to take the train all together to ensure we would meet our guide at the correct place. Before leaving for the train, a few of us decided to look for a quick breakfast to take with us. We found a bakery that had meringues that were larger than softballs and that looked very delicious. All the colors brought us into the store and our food there was really good. After we arrived we met our tour guide who was very enthusiastic to meet us and show us around the neighborhood. We first started closest to the metro stop and we ended at a beautiful old cathedral that we were told had finally been done being renovated and you could actually, for the first time in a long time, see the front of the church. 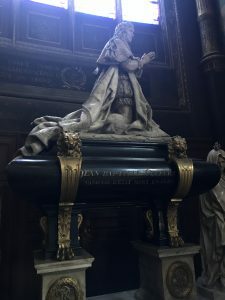 It was very cool to see where some of French history’s most important people were buried, including the treasurer to King Louis XIV, who was brought to the cathedral at night because his taxation of the poor made him unpopular, and the French thought that people would essentially attack his funeral. The tour guide was also awesome because she was incredibly enthusiastic and very well prepared. She walked with a journal with fabulous maps and different visuals of what she was talking about. This was really cool because if she was talking about how a building changed over time, she was able to show us that transition through her images she brought as opposed to saying this building used to have wood but now it looks completely different. After we had our guided tour we had a few hours to walk around, shop, and eat before our film class. We all later regrouped at 3pm to have our film class in the ISA office. During this time we discussed the movies, An American in Paris, Midnight in Paris, The Women of the 6th floor, and Paris Je T’aime. We spent the majority of the class discussing The history/ time periods of when these came out. We also spent time watching clips from Paris Je T’aime while making note of what was “Paris” and what influence did the director have. After film class, we had some time before the football match would start so Jenny, Aidan, Anna, Austin and I decided that we would look at the Saint Chapelle church. At first, we were unimpressed by the first floor but Anna shortly took us upstairs to be absolutely blown away by the incredible stained glass that filled the room. Stained glass was used to tell the stories of the bible for people who were illiterate so they could still learn the stories. For me, stained glass is one of my favorite things to look at and I still cannot believe how captivating the room was. Also included was another portal of the Last Judgement above one of the doors to the back side of the upper room. 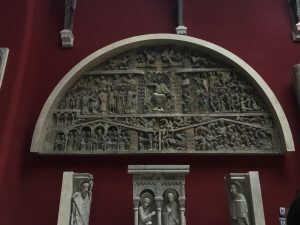 The Last Judgement portal on Notre Dame is more elaborate, but it was still cool to see that connection. For the world cup game today, France and Belgium were playing to move on to the finals. We all decided that we were hungry so we found a nice restaurant in a good neighborhood that was right off of the metro we all take home for the most part. It was very hard trying to find seats even an hour before the game because people had been camping out all day reserving their spots. We ended up deciding to go to a very nice restaurant right next to the Saint Placide metro stop that had very nice chandeliers everywhere and where we had a perfect view on the television. We all got food which was delicious and watched the game. It was really funny to see how much everyone got into it because in America we don’t have many sports where people go as crazy as they do here for soccer. It was a very intense game with a lot of screaming. It was really fun to see how everyone came together to watch and support their team with blue, white, and red whether they were wearing a jersey, makeup, a flag, or whatever other things they may have had. Once the game finished we rushed to get home before the crazy crowd would be on the metro. Thankfully we were in a really safe and nice neighborhood and we all got home safely which made the experience 10x better. I cannot wait to see France play again in the final on the 15th. Allez Les Bleus!!! July 9th, we started the day off by meeting at the metro stop St-Lazare before we would board a train to Giverny. Many of us came early to make sure he wouldn’t miss the journey to Normandy to visit Claude Monet’s house. 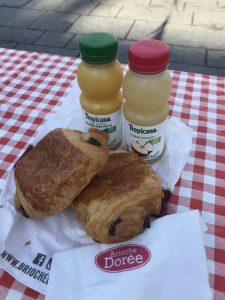 We went to Brioche Doire, which seems to be the French equivalent of a Dunkin Donuts for breakfast and it was affordable and good. 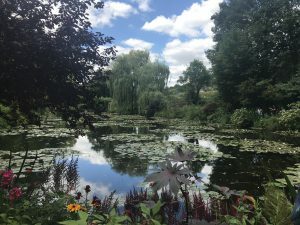 After eating a quick breakfast, we boarded the train which took about a half hour to leave the station, and we got to Giverny. 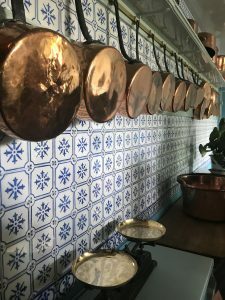 At Giverny, we did a cafeteria-style lunch where we all picked what we wanted, essentially a la carte. 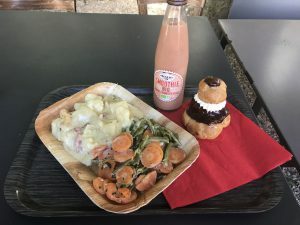 We got foods that were specialties of the region of Normandy, and Normandy is known for cream and dairy so I had cheese and potatoes and cream and chicken. The food and desserts were great! For dessert, I got a religieuse which is two choux pastries filled with chocolate crème and they were outstanding! I had learned about them in my French high school class, so when I finally got to have one I was very excited! After lunch, we went to the gardens, and more specifically, the water garden. To say that this lived up to my expectations would be a severe understatement, it wildly surpassed them! 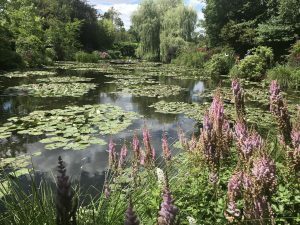 The little pond and the water lilies were just stunning. 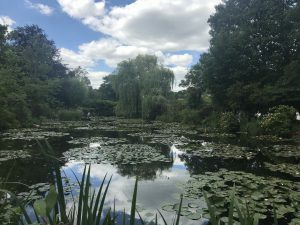 We learned about Monet took a trip to paint the Eiffel Tower, and while there, found water lilies at the Trocadero. It quickly became clear to him that he should paint the lilies instead of the Eiffel Tower. Another fact we learned about Monet was that Monet never painted nudes, which I found interesting. 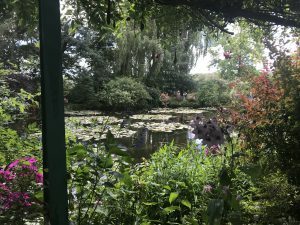 Our tour guide was very informative and just to see the garden where some of the most iconic impressionist paintings were inspired by and created was incredible. 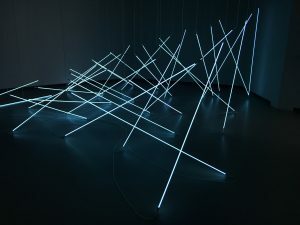 It was awesome to see how the light constantly changed and it made me think to myself how, personally, I would feel really frustrated painting there because of that constant change. However, for Monet and the impressionist painters, that was the essence of their craft. To catch that fleeting moment, to paint when the light was bright, but to have it quickly change, for them really encapsulated the feeling of the time that the world was changing, and everything was moving much faster due to technological advances in society. The garden then by the house has flowers in rows and it was really cool to see. 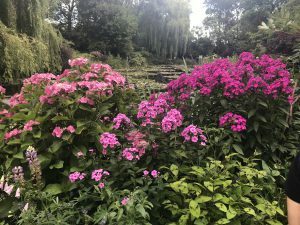 The entrance to the house where Monet would impress his guests by taking them into the garden and seeing how beautiful all of the rows of flowers were. I took lots of pictures of all the different flowers because many of them I had not seen before. 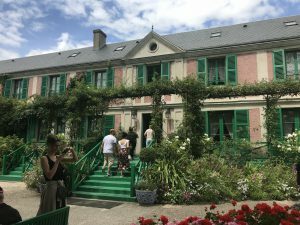 Truly, this visit to Monet’s house and Giverny was one of the many highlights of the trip. Unfortunately, on the way back our train was delayed about an hour, but this still was a good traveling experience because sometimes things do not go according to plan and you must adjust for it. These are things that you must learn to deal with and experience when traveling. The trip is not only discovering the francophone world, but it is also discovering how to travel, and how to be a smart traveler. Upon returning, Aidan and I went to get a preview of Les Halles and go to the store GO Sport, where I got a France world cup jersey that I really liked and had been searching everywhere for. I also got makeup that was blue white and red like the French flag to put on people’s faces for the World Cup semifinal against Belgium the next day. I was very excited about it, and at dinner, my host mother surprised me with a France shirt because she knew I was searching for one the whole trip. It was incredibly nice of her and I cannot thank her enough for looking for it and thinking of me. On July 8, we spent our second and sadly final day in Lyon. After we woke up and got ready, we were given pain au chocolat for breakfast and then later served a delicious lunch. For lunch we had duck, ratatouille, rice, and two different salads. All the food was delicious, and it was cool to know that we picked up the food at the farm the day before and you could tell how fresh everything was. This was the first time Aidan and I had eaten duck and it was really good! I was also excited to try ratatouille and it did not disappoint. After we had our lunch we had some of our chocolate cake from the day before along with a praline cake. The cake was delicious, and I was very excited to try it. When Mahaut visited in the states, she brought a recipe for praline cake along with pralines which was in French so at the time we gave it to my grandfather to translate and try to bake. Unfortunately, it didn’t come out correctly and we weren’t able to eat it. After our lunch, we headed into the city of Lyon to discover all it had to offer. 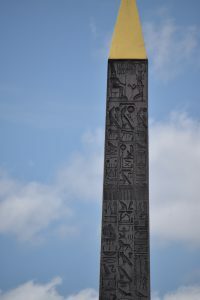 We drove into the city and went to Place Bellecour where we were shocked to see how large the area was and Mahaut explained that there are normally a lot of people there and they hold different events. After, we walked through Vieux Lyon where we went through many shops along with stopping at the Cathedral which was still beautiful even though it was under repair. 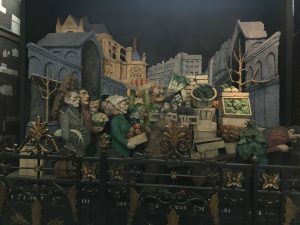 After that, we looked at a museum for special effects that held props from a lot of different famous movies, including Spiderman and Batman Begins. After that small special effects museum, we took a small hike up to Fourvière. The walk was very tiring because there are so many stairs and often I had to take small stops. There were some sculptures on the walk which made the walk more enjoyable. Once we got to the top of the hill, the view made all the climbing up those stairs more than worth it. We looked down upon the city and we could see both the Rhone and Saône rivers. We went to the Notre Dame de Fourvière. I couldn’t believe how incredible the inside was with all the beautiful architecture and stained-glass windows. It was grandiose, and I could not believe just how beautiful it was. We then tried to go to the Gallo-Roman theater, but it was closed for a show. We took the train back down the hill and another to Le Institut Lumière. We then had to take a short train back to the airport where we then took another train back to Paris. I had an amazing time in Lyon and I cannot wait to visit again. It was so amazing to finally see my pen pal again after 6 years and hopefully next time we see each other it is a lot sooner! 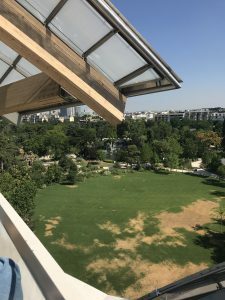 To finish our week, on July 6th we visited le Fondation Louis Vuitton. While walking by Le Bois de Boulogne and Le Jardin d’Acclimation, we stumbled upon a huge white building surrounded by trees. Once we got closer we were able to see a beautiful waterfall in the front of the building which we later got to walk next to. Once we headed up the elevator for our tour, we were stunned by the beautiful views of the city. We started our tour on the top terrace of which there were three of. Here we were told about the architecture. We were told the building is based off a boat because the boat it the symbol for Paris. The sails were made from 3600 square meters of glass and the building was constructed of steel. We learned about le Jardin d’Acclimation which was used to acclimate animals to the climate of Paris before they were sent to live in zoos. The building also represents a greenhouse because that is where they would keep the palm trees when it was too cold out. 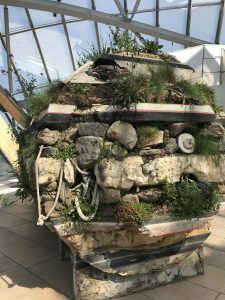 Our tour guide also pointed out that there was no grout between the tiles which is used as a way to collect water to fill the waterfall outside the building along with used to water the many plants that are present. We also got to see the Takashi Murakami exhibition, who is a Japanese painter. He draws inspiration from Manga, a type of Japanese anime, and it is evident in his style. 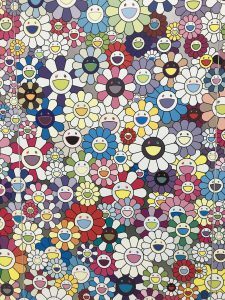 He was the artist that designed the cover of Kanye West’s 2008 album “Graduation.” One room was an entire room with the walls from ground to ceiling and all around designed by Murakami with smiling flower wallpaper. The tour guide mentioned that they look like daisies, but they are chrysanthemums, which in France are used at funerals to mourn while in Japan they are a sign of happiness. 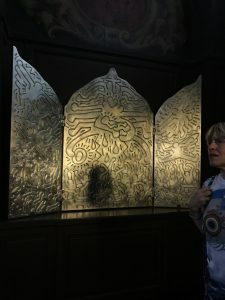 There were a number of other works of art we saw, one of my favorite being the floating volcanic rock that was being suspended about a half foot, and beneath were just a few different aquatic animals I had never seen before. I did not really understand what it meant, but it was an interesting and unique piece of art, nonetheless. 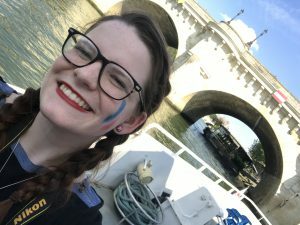 At 3pm we met at the ISA office to recharge our Navigo cards where one of the employees was nice enough to give us all France make up which were worn on our faces and arms while France played their game in the world up. After we walked to the bateaux mouches where we took a tour of the Seine which was beautiful. It was great to see the city from below on the water and see how everything connects while saving our feet from more walking. I think this was a great way to finish out the week because it was almost a wrap up of all the things we had seen during the week. After that, Aidan, Zoe, Caroline, Jenny, and I, went to eat at a restaurant around Saint Michel. We got a quick bite of food before the soccer game had finished and luckily, we were watching the streets from above. 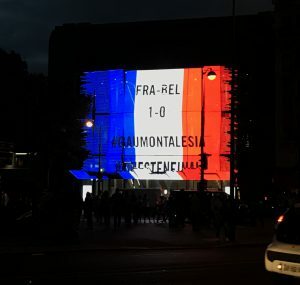 After the match, a large group of Parisians stormed the streets, walking straight into the middle of traffic of cars because they were so proud of their victory. The crowd was so large we could feel the building slightly shaking in their march up the street! After we finished dinner, Aidan and I went to the Louvre quickly to see some of the artworks we have been dying to see. First, we saw the exposition of Eugene Delacroix. In my 8th grade classroom, my teacher had a recreation of Delacroix’s Liberty Leading the People, which he drew, hanging on the wall. I always loved this painting so when I found out that I could see it at the Louvre I was beyond excited. 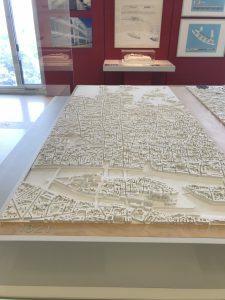 After the exhibition, we saw a lot of marble carvings which I find fascinating. After that, we ran to find the “Winged Victory of Samothrace” which sits on top of a beautiful set of stairs. After that, we ran to find the Mona Lisa which the French call, La Joconde. We looked at many other paintings before realizing that Vermeer’s The Astronomer was also in the Louvre. We asked for directions to it and were told it was located upstairs on the direct opposite side of the building. We rushed to get to it in time but were a few minutes late. 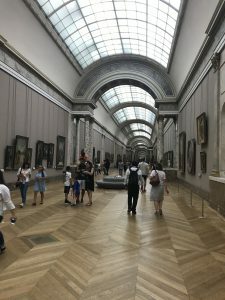 It was okay though because even if you are rushing to get somewhere in the Louvre, on the way you see so many beautiful works, and we know we will be back again. At the end of the night, Aidan and I got dinner at a café right outside of the metro stop that I go to, Alesia. There we saw a group of 11 people sitting at a table signing to each other. This was cool to see because when I was young my mom taught me sign language and it was the first time I had seen a large group signing. After we ate, I went home and that concluded our day! 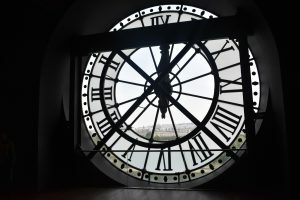 On July 5th, we headed early in the morning to the Musée D’Orsay, a 19th-century train station that was turned into a museum to house 19th-century art. I referenced this before in my earlier post, but the French do not simply do away with buildings that aren’t being used. 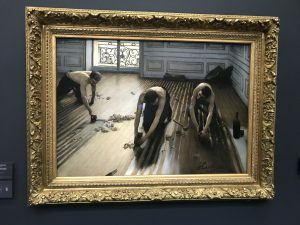 Their culture and their importance on it is not about “out with the old, in the with the new” it is certainly more focused on the “old” being repurposed, as was the case with the Musée L’Orangerie, the Musée D’Orsay wasn’t being used but they didn’t tear it down. They kept it, and it being where all the 19th-century art is held is perfect because it is a 19th-century train station. 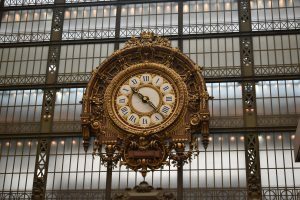 Cast iron, the gigantic and beautiful clock that hangs above the entrance, set the stage and the context that really makes you feel like you’ve taken a step back a bit in time to view the art of the time. First, we looked at a few paintings that the art academy of the time really loved, like the Birth of Venus and Rosa Bonheur’s Plowing in the Nivernais, the only non history painting to be awarded the top prize by the academy during the 1849 exposition. 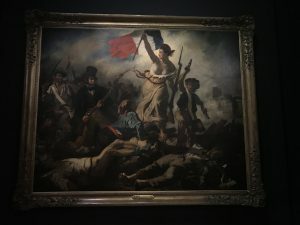 We learned this was because of the destruction caused by the Workers Revolution of 1848, people really appreciated any art that took them away from the war zone that was Paris, and Bonheur’s painting did exactly that. 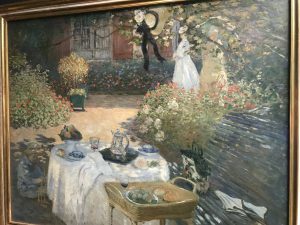 Moving forward we looked at impressionist artists, including but not limited to, Monet, Manet, and Caillebotte. These artists tried to capture the idea that during the 19th century, the world was changing, and it was changing fast. The industrial revolution as we have discussed on the trip has revolutionized the way people think about work and introduced the idea of leisure and the “weekend.” So these artists, especially Manet and Monet start painting with quick brush strokes, and the paintings themselves become more abstract but are there to simply catch an impression, a quick glimpse into the life of the subject because life now moves so fast you only have time for a minute. I certainly feel that this applies today and how things just move so quickly and the internet amongst other things have really made the world interconnected. I think the impressionists captured what they were going for and the mid-19th century really is the middle of the transformation of human society with the development of railroads and steam engines, etc. 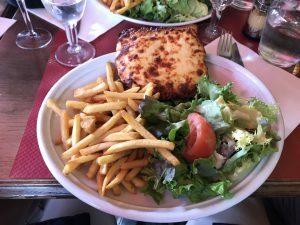 After the Musée D’Orsay we went back to have lunch, Aidan and I ate at Le Quartier de Notre Dame, a nice little cafe and it was very good! After that, we went back to ISA to have a class about the films we were supposed to watch. They included an 1895 Lumiere Brothers film, A Trip to the Moon (1902), Au Bonheur des Dames (1930), Amelie (2001) and Paris (2008). The 1895 Lumiere Brothers movie was very much a more documentary style movie, as were Au Bonheur des Dames (the emergence of department stores) and Paris (the city itself being almost a character in the movie). Meanwhile, Amelie and A Trip to the Moon were more creative, had more plot development and character development and were quite quirky and, in my opinion, impressive films. The discussion was about an hour and it was interesting to hear the different students’ perspectives on the different films we watched and to also hear Professor Salmon’s input on the films as well. After the discussion at ISA, I returned back to my homestay but first went to the grocery store. I went to a “bio” grocery store which essentially means a focus on organic foods. I have multiple allergies so usually, these stores have things that I can eat like gluten free and peanut free foods for example. It is just nice to know that even though I have these allergies I can find food and not have to really worry too much about what I am going to eat. We ate dinner a little bit earlier than usual, 11 pm, which is still late but it’s not as late as it has been and what can be typical for a French family. All in all the trip to the museum and the discussion made day number four of our trip and exciting and eventful one! On the Fourth of July, we took a trip to the Palais Royal. Located in the 1st arrondissement of Paris, the Palace was home to the Queen of France and wife of King Louis XIII, Anne of Austria, mother to King Louis the XIV. 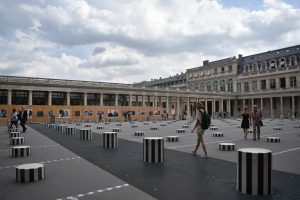 Today the Palais Royal features a courtyard with these long black and white columns. You are allowed to climb them and they were very interesting. When you walk around the Palais today, underneath are lots of shops, and while they are very expensive, they hold very unique and cool items that really you could only find here. These shopping arcades were introduced during the 18th century, and really became the center of Parisian life. 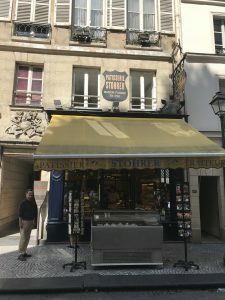 Walking around, it is very cool how the arcades are very small, but back in their time of introduction they allowed Parisians a way to browse and look at items without getting their shoes and dressed muddy because the arcades themselves were covered and paved. We ate at the Victoria Station Restaurant which was very cool and designed like an old train car! 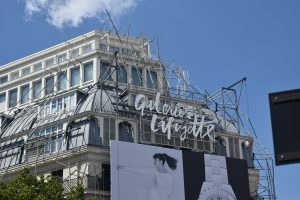 The food was delicious and we moved on to the “Galeries Lafayette”, the department stores in Paris that date back to the late 19th, early 20th century. 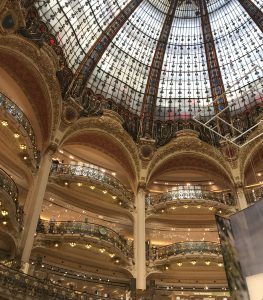 These department stores were very luxurious and had shopping brands like Louis Vuitton and Cartier among others, but what was honestly really impressive about them were the stained glass domes that were on top of the department stores. 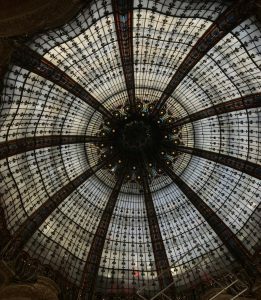 The first one we saw was in the Galeries Lafayette, right in the middle so that when you are shopping and you look up, you see this glorious stained glass dome. This brought about the conversation and the idea that at this point in time, capitalism and architecture were becoming intertwined, and the idea that if you can build a store so that people want to be there, they will spend more. 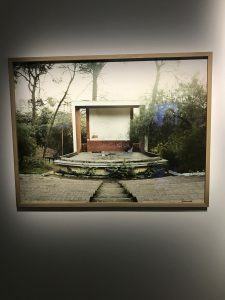 It did certainly make me feel like I was in a “paradise” of some sort and being almost overwhelmed with the “luxury” of the experience. The second stained glass dome we saw was now in a restaurant. Throughout the day something that really stuck with me was the idea that the French actually preserve their culture. They actually tax people in order to maintain statues and monuments and buildings, but all in the name of building and preserving a cultural identity. The French really will just let a building sit there for awhile until someone comes up with an idea of what to do with it. After the French Revolution of 1789, the government took all of the royal belongings and made them publicly owned. They did not tear them down and build something new, they decided to repurpose them and preserve the old buildings and their beauty. This is something that I wish were true in the United States and it is unfortunate that in many cases I could envision in the United States a building being torn down to make a skyscraper or to just simply accommodate for more people. 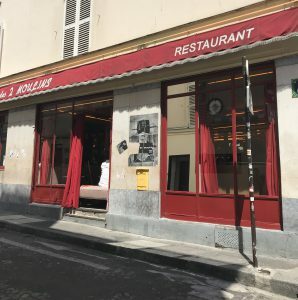 The French take their culture very seriously, and I have so far enjoyed the days we spend looking at and walking through these old buildings because it is just not something we can experience back home in the United States to the extent that I have been able to here in France. 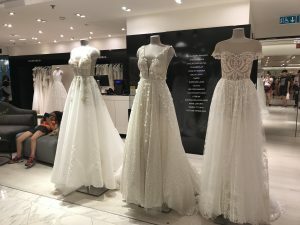 After that, we stayed in the area and went shopping in a store that had three floors and was like a department store aimed towards young adults. There were kids playing FIFA on an Xbox and games going on, as well as many department stores outlets like Nike, Adidas, Le Coq Sportif, and much more. The store was somewhat geared towards sports but also just had regular clothing brands, and not ones you really see back home in the United States, so it was definitely a cool experience! After that, I headed home and we ate dinner pretty late, around 9:50 and I talked with Veronique, my host mother, until midnight! For dinner, we had meat and rice and for dessert, strawberries and yogurt. It has been difficult to get used to how late the French eat but I have very much enjoyed the conversations and the experience nonetheless. 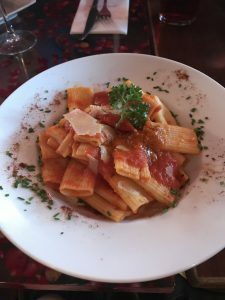 At home, we usually eat at 5 and dinners are short, so these longer dinners are definitely something different for me. Because I was alone with my host mother, I was able to practice my French more and when she needed help translating French to English I helped her and when I needed help remembering french words she helped me! 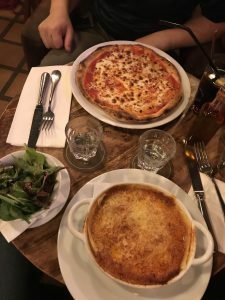 The dinners that we have had, even though they happen very late, are one of my favorite parts of the day because I get to learn about life in France in a very personal way. Today we started the day meeting at the ISA where we made sure to fill up on water because the day was going to be hot again. After we met up, we walked to the metro station chalet to eventually take the RER which is a fast train to where our bus tour would pick us up. On the way to the train station, we stopped several times to learn about history of the buildings and about the architecture. The first building we saw was the Conciergerie where Marie Antoinette was held in prison before she was decapitated. 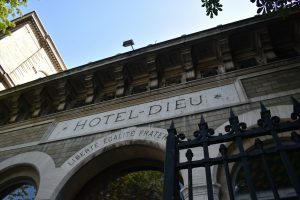 The next building we stopped at was Hotel Dieu. We learned that in France not all buildings that say hotel mean hotel where you stay for a night. The hotel we saw was a place where you can receive medical treatments. After that, we stopped by a Napoleonic water fountain and learned about French history. We learned that there wasn’t a lot of drinking water in France so Napoleon decided to make public water fountains for people to get their safe drinking water from. We talked about the architecture of the fountain with sphinxes from Egypt and an obelisk with a lotus design which also came from Egypt. We talked about how Napoleon really set up France and a lot of the organized France in this idea that he would conquer the world and France would be at the center of it. Napoleon set the standards for having one language because as France had existed up until the French Revolution, many of the regions of France were very isolated from each other and spoke different languages and dialects. 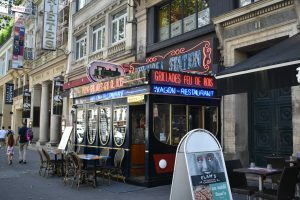 After learning about Napoleon and the fountain, we got to the Châtelet stop and took the RER to where the open bus tour company was. 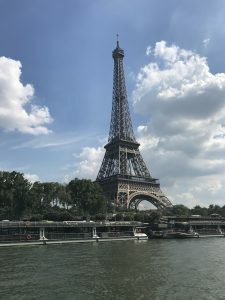 On our tour we saw the opera, Palais-Royal, Musée du Louvre, Musée d’Orsay, Place de la Concorde, le Champs-Elysées, Arc de Triomphe, the Trocadero, the Eiffel Tower, la Madeleine, and many more. After we finished our bus tour, we had free time to take more bus tours or eat. I went to a restaurant that had pizza and burgers but more importantly had air conditioning. I ate a salad and for dessert, a crème brûlée. This was my first time having one and it was so amazing. After that, we went to the Champs-Elysées to go shopping and to specifically look for a France soccer jersey. After this, we went home and until dinner I had slept because the heat had exhausted me so much. At dinner, we ate lamb, rice, tomatoes, and bread. For dessert we had fruit and yogurt. We talked at dinner about how the food is much different in France than in the US and how things taste better here. We also talked about our plans for traveling on the weekend along with learning a little bit about French laws surrounding police, military and guns.